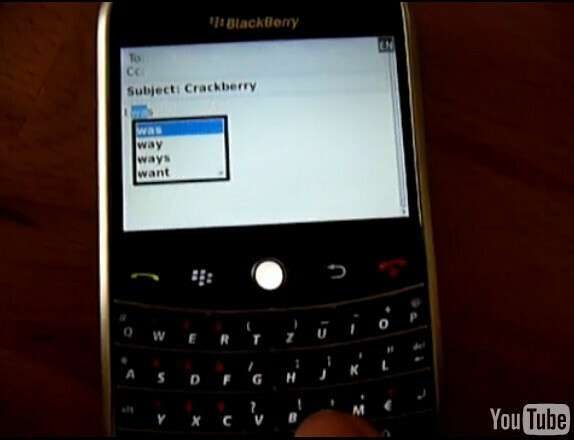 Imagine writing a text message on your BlackBerry Bold using the sweet as honey full QWERTY keyboard on the device. Now add to that pleasure a box that pops up on the screen with SureType predictive text. After playing around with a Bold loaded with OS 5.0.0.110, the guys at Crackberry discovered that RIM engineers didn't want to limit this feature to models using a keyboard with 2 letters on each key. Just like on the Pearl and the Storm's SureType keyboard, once you start typing, a box will pop up on the display with a few different words that the phone predicts that you want to write based on the letters you have typed. 35,000 words are included with the application and that number can be raised or lowered by making manual additions or deletions to the list of accepted words. With the combination of a full QWERTY keyboard and an OS that seems to always know in advance which word you want to type, BlackBerry users now have at least a couple of good reasons (BlackBerry Messenger?) to look forward to the operating system builds that begin with the number 5. Check out the source link for a video on how SureType works on a QWERTY keyboard enabled device-namely, the Bold..